We have been doing quite a few table settings for our clients lately, and we love the personalized touch it adds to the homes. 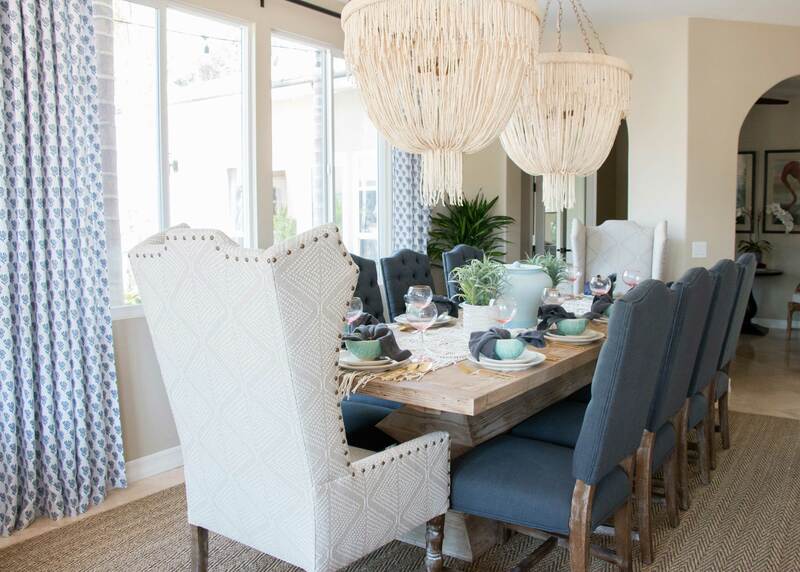 As we wrapped up a project in San Clemente we were excited to document the dining decor and now we’re sharing how we prepared the table setting! Our client wanted a table setting that she could use for large family gatherings and special occasions. She hoped for something fun and playful without being too formal. So here’s what we did and how you can too! Start with a design theme in mind. 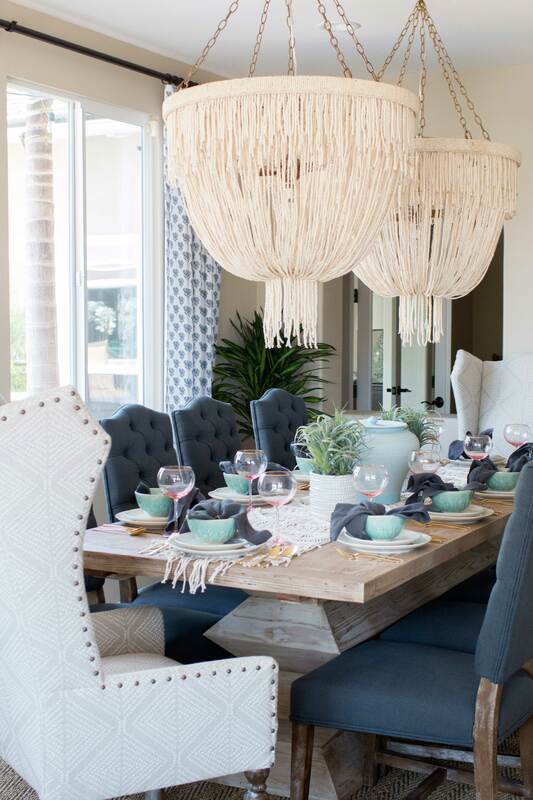 In this case, we focused on keeping the design fresh and clean for summertime entertaining. We find it easiest to choose one piece that really speaks to you, and build upon that. For us, it was the macrame table runner. It’s a perfect neutral that adds another layer of texture to the table and doesn’t compete with the dishes. Pick your plates. 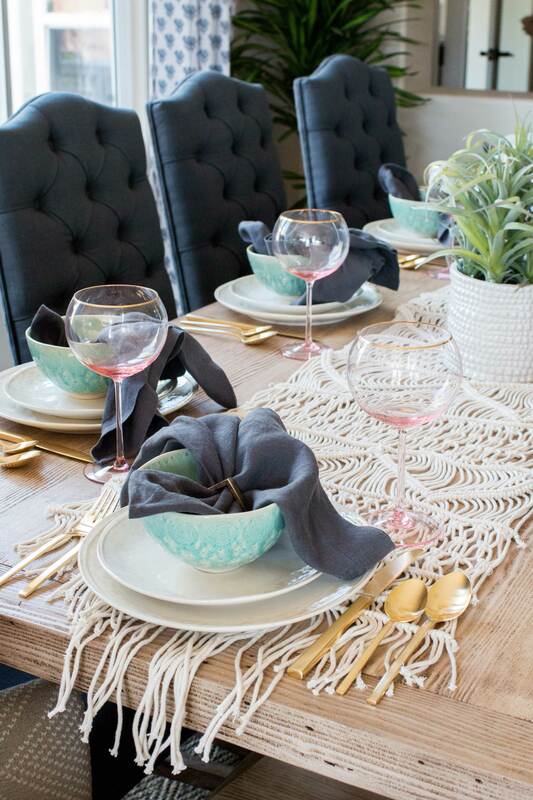 Plates are the foundation of your table setting that you can later build upon with coordinating accessories. Since we layer dishes, napkins, and sometimes more on our stack of plates, we prefer sticking to solid-colored plates that limit their visual interest to the finer details of the shape and texture. Save the pattern play for pieces that aren’t covered up by other accessories. In this project, we went with an off-white for the dinner and salad plates so we could bring in more color with other dishes that could easily be switched out per occasion. White dishes are classic and never let you down, and these in our table setting with imperfectly rounded edges give classic a unique spin. By keeping your plates simple it allows you to have more fun playing around with bowls, glasses, napkins and accessories. Think timeless, although you may love the vibrant pattern on those plates today, will you still love it a few years down the road? Mix and Match! Now that you have the basics down, you can have fun with the rest of your table settings. We fell in love with these rose pink wine glasses and incorporated them into the setting. 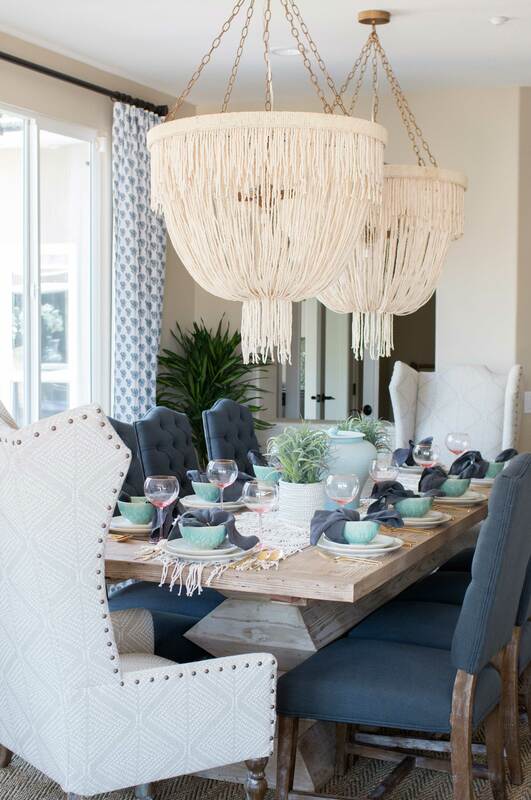 From there, we wanted to keep the vibe fun and light for summer, so we brought in a bright pop of blue with the bowls. The silverware was a no-brainer for us! We are all about brass and gold finishes right now, and this flatware paired perfectly with the gold rim on the wine glasses. The squared edges on these utensils add a subtle modern flare to the table setting. If you’re looking to go in a more traditional direction, we recommend rounded edges on your forks, knives, and spoons. Although gold flatware can be intimidating with its specialized care instructions, we hope this isn’t reason for anyone to shy away from the pretty pieces! Many of the sets we have found require you to individually hand wash each piece (including the set we chose and linked below), so limiting them to special occasions only will save you time cleaning in the kitchen. We suggest finding something dishwasher safe for your everyday needs. Finishing touches! 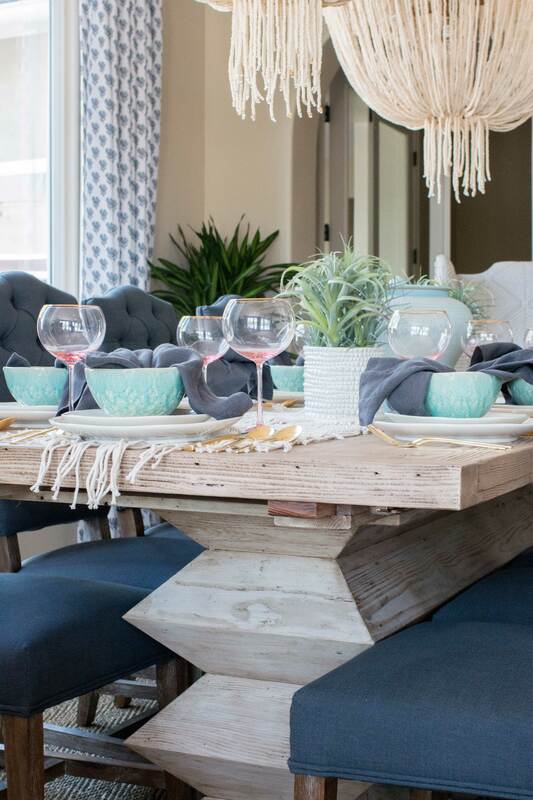 Look for textures and tones around the room that you can incorporate into your table setting. We played off the navy dining chairs and brought in solid, charcoal napkins to add another layer of depth on the table. We used brass napkin rings to play off the silverware and keep things clean and consistent.